NCI 7880 and parcel scales are suitable for heavier or oversized items. They are as big as 24 inches, able to handle most large parcels or containers. These bench scales have a high capacity, up to 250 lb and are switchable between lb/kg for added flexibility. With its fast digital response and large 18 x 18 weight platter it easily accommodates oversize parcels or containers in the shipping room. With the DuraBridge™ technology the 7880 withstands the rigors of day-to-day use. Model 7880 has NTEP and Canadian Weights and Measures approvals, to ensure accuracy. Alternative resolutions can be accessed using the “H” command, or the “M” command to enable piece counting. DuraBridge technology Reduces overall scale deflection to less than 1/2 when a full load is applied. Fast digital response Speeds weight processing time. Large 18 x 18 weight platter Easily accommodates oversize parcels and containers. Allows for connection to a computer or smart terminal. Uses standard PC cable to 9-pin "D" connector on scale. High resolution mode "H" command accesses increased resolution. Calibration Alternate span points can simplify field calibration using less than full capacity weights. Overload stops located in base of scale. Helps to protect load cell and extend the scale's life. Simple to use Reduces operator training time. Internal display Front mounted 1/2 H, 6 digit LCD. RS-232 cable Allows you to connect to a PC. Ball-top weight platterSimplifies transport of all parcels and ideal for conveyer lines. Remote display6 digit LCD housed with a 7- foot cable. Construction Stainless steel weight platter and a painted die cast aluminum base. 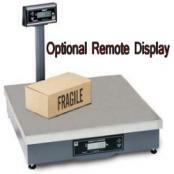 Weight 45 lbs or less when prepared for shipping. Input/Output RS-232, bi-directional, configurable 1200 - 19.2K Baud. RS-232 10' Interface Cable (9 Pin to 9 Pin)included with each scale. Part Number ...... Description .......... Ship Wt. *Custom or non-stock item. *Please allow 5-day lead time. Orders for 5 or more, call for delivery schedule.